The ICW1000G is Dual-Band SIP Wifi phone that has excellent build quality, a strong feature set, extended battery life, and superb voice quality. 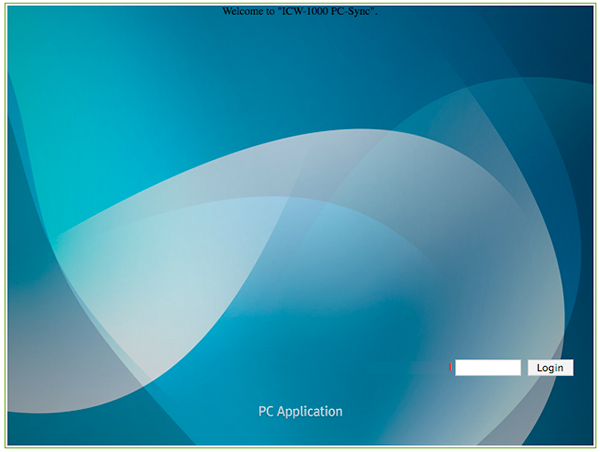 These instructions are based on ICW1000G software version 1.00.9; if you are running a different software version some menus and settings may be different. These instructions are also based on using the ICW1000G in its factory default configuration. This guide also assumes that you have properly associated your phone with an access point and that it has retrieved a valid IP Address. If you need assistance associating your phone with an access point, please refer to the ICW1000G product manual mentioned in the resources section of this guide. A - Before you can configure your phone our service, there are a few prerequisite steps, such as setting up a password for the Lock PC Sync portion of your phone. To do that, from the main menu of your phone, navigate to the Settings >> Preferences >> Lock PC Sync screen. From here, select Enable; you should be prompted to specify a PIN. This is necessary for access via the web portal. B - Next, you will need to retrieve the IP Address of your phone. 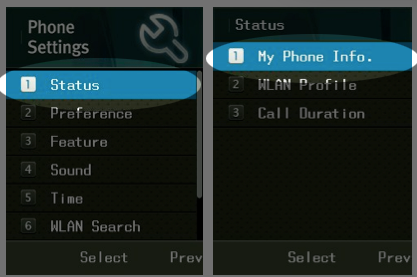 From your phone's main menu, navigate to the Settings >> Status >> My Phone Info section of the phone's admin interface and select Network Info to display the current IP Address of your phone. On the top right corner of this page, click on Setup, which should bring up a dialog window prompting for an ID and PW (password). By default, the ID and PW should be admin and 000000 (respectively). Once you have entered the ID/Password, please click on the Login button to continue with the configuration process. Displayname You may enter any value for this option. Phone Number This is either the default extension 1777MYCCID OR 1777MYCCIDEXT, where 1777MYCCID is the 1777 number assigned to you by Callcentric and EXT is the three digit extension you are trying to register this UA to. User ID This is either the default extension 1777MYCCID OR 1777MYCCIDEXT, where 1777MYCCID is the 1777 number assigned to you by Callcentric and EXT is the three digit extension you are trying to register this UA to. User Password Enter your extension SIP Password here. Your extension SIP password is the password you created for the extension you are trying to use. You may edit the SIP password you wish to use in by logging into your My Callcentric account and clicking on the Extension menu link and then modifying the appropriate extension. Once you are done, please click on the Change Value to save the settings you've entered. After you have entered the settings mentioned above, please click on the Change Value to save the setting(s) you've entered. From the section list on the left hand side of the page, please locate the section labeled MWI. In the MWI Section, locate the option Use MWI and set this option to On. Click on the Change Value button to save the setting(s) you've entered. Next, we will be modifying the audio codecs on your phone. From the section list, there should be numerous NETWORK profiles. The network profile corresponds to the WIFI Profiles that you've defined on your phone; which gives you the ability to set specific audio codecs for each access point you've associated your phone with. Once you've selected the appropriate network profile for the current access point your phone is associated with, locate the option Payload type. On the given space, enter 18 0 as indicated on the screenshot below. Once you've made that change, click on the Change value button to save the setting(s) you've entered. Finally from the section list, select the DTMF option. On the DTMF configuration page; locate the option Mode and from the drop down menu and select RFC2833. Click on the Change Value button to save your changes; and finally the click the REBOOT button for your changes to take into effect.